Figure 3. When analyzing a wind turbine blade, HyperSizer software performs panel swaps to identify the optimal design criteria for a particular region of a wind blade; minimizes ply drops to cut costs, improve manufacturability, and increase fatigue life; and works with finite element analysis (FEA) software to redefine zones of laminate thickness and then calculate loads to be used in its optimization routines. To meet these tougher requirements, earlier all-fiberglass wind blade designs are being redesigned to incorporate more structurally complex sections made of a mix of fiberglass with higher-performance graphite epoxy (carbon-fiber) similar to that seen in the aerospace industry. Of course, these newer composite materials require a more sophisticated design engineering approach, as well as different handling, fabrication, and curing methods. The optimal number of shear webs (spars) and their placement. Whether to go with solid laminate versus sandwich or stiffened panels for unsupported areas. How to properly proportion the material around the chord of the blade (from leading edge to trailing edge), and then down its length. What is the strongest carbon-fiber/fiberglass percentage combination and layup stacking sequence that can be achieved at the lowest weight? How do you arrive at the optimum balance of least-complex, lightest-weight composite tape and fabric layup sequencing with minimal ply drops that results in the lowest fabrication costs within a 24-hour production cycle? The sooner these questions can be answered in preliminary design, the more energy- and cost-efficient the final wind blade will be. The software surveys thousands and even millions of design-candidate dimensions and laminates, quickly evaluating early designs in a ply-by-ply, and even finite element-by-element manner. By sizing (optimizing) all possible permutations and combinations of composite laminate, the software gives engineers a highly accurate picture of the consequences of proposed design changes (Figure 3). Structural integrity is verified, failure modes are predicted for aeroelastic load cases, and required safety factors are achieved. 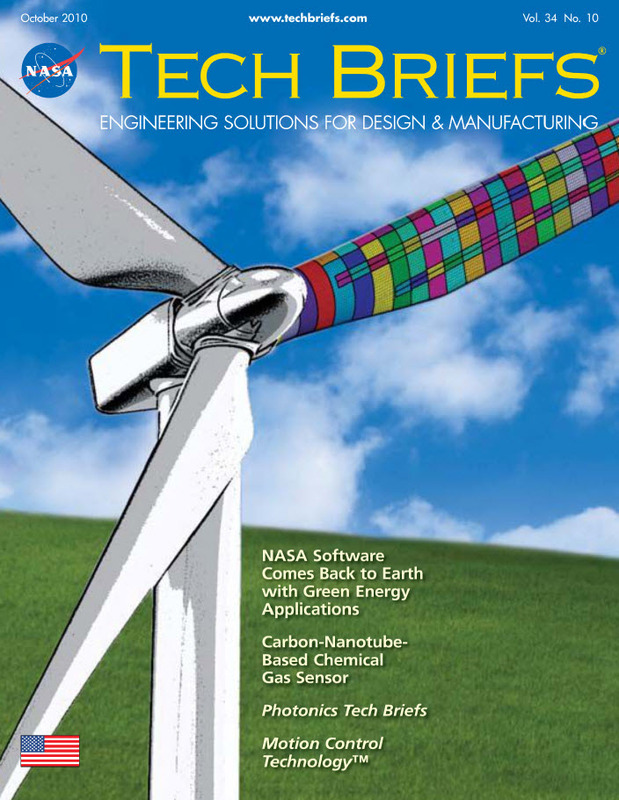 Designs can be fine-tuned in this way to simultaneously target optimum manufacturability, minimum weight, and lowest cost, all of which can help wind power be more competitive with fossil fuels. In the search for greater efficiencies, how much bigger can wind blades go? Offshore turbine blades are already being built at 60 meters. And there are prototype and concept blades on drawing boards that approach a staggering 100-meter length, which, from tip to tip, is more than three football fields in length. This scale of blade length requires significant architectural changes because the loading involved is not only flapwise (causing lift, as with an aircraft wing), but also edgewise, such as a cantilevered beam. These huge blades have no aircraft parallel. Wind engineers are now entering into a “clean-paper” area of design where innovative thought, supported by architectural trade studies that quantify reliability, is in high demand. Collier Research is currently working with Sandia on very large offshore wind blade designs to help establish their credibility so that industry can take them to the next stage of manufacturing. Software tools created for flight — but now are applicable to creative responses for more earthbound challenges — have come a long way from their NASA Langley origins more than two decades ago.